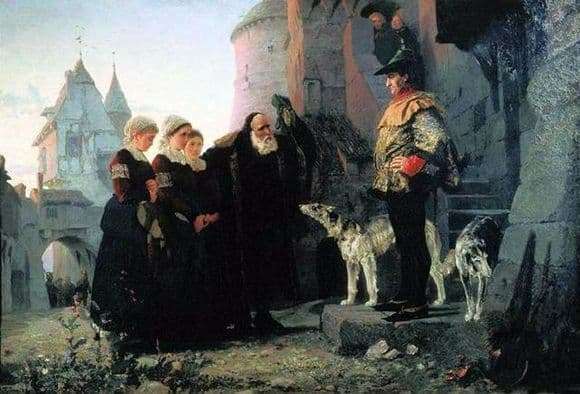 Vasily Polenov is a realist artist. The canvas “Right of the Master” was created in 1874. The place of storage is the State Tretyakov Gallery. The plot of the picture was based on the medieval right of the feudal lord to hold the first night with all the girls who decided to marry in his domain. A similar right existed in France, Scotland and England. In Russia, it was also known. On the eve of the wedding, the feudal lord had the right to appear before the bride and spend the first wedding night with her. If after that the girl was in the position, the child would be recognized as the heir of her actual husband, but if the feudal lord was absent, he could be recognized as his heir. It should be noted that the existence of the right of the first night was not a whim of the highest nobility. Such a right was an urgent need for those whose lives at any time could be interrupted by infection with plague disease, leprosy, smallpox, wounded in battle, poisoning, or an accident. The death of a feudal lord, who did not leave behind a legitimate heir, could have unpleasant consequences for his vassals. About justice and moral side of the question to speak of. Without knowing the history of this custom, it is difficult to assume that the action taking place on the canvas is not an ordinary visit of politeness. The central place in the picture is given to three young girls and an elderly old man, frozen on the threshold of a house in front of a richly dressed man. The eyes of youth are lowered, the back of a man is hunched, the stern face is riddled with wrinkles, on it is a mask of suffering. The girls are dressed in modest dark clothes, their hands are crossed on the chest or waist, they obviously have no desire to be in this situation, they try not to look at the man. The latter, meanwhile, is not at all ashamed of his position, his hands rest on his sides, his eyes are stern and piercing, his satisfaction and even his joy are read. The high position of his emphasizes expensive camisole, hat and white hound dog, carefully peering into the unexpected guests. The background of the picture is a typical medieval castle with turrets, arched entrances, knights at the gates and a servant scurrying everywhere. The picture is painted with bright oil paints, but in spite of this it is rather gloomy, which forces the viewer to carefully look at each of the details of its components.